Instant downloads of all 945 LitChart PDFs (including A Family Supper). Welcome to the LitCharts study guide on Kazuo Ishiguro's A Family Supper. Created by the original team behind SparkNotes, LitCharts are the world's best literature guides. A concise biography of Kazuo Ishiguro plus historical and literary context for A Family Supper. A quick-reference summary: A Family Supper on a single page. In-depth summary and analysis of every of A Family Supper. Visual theme-tracking, too. Explanations, analysis, and visualizations of A Family Supper's themes. 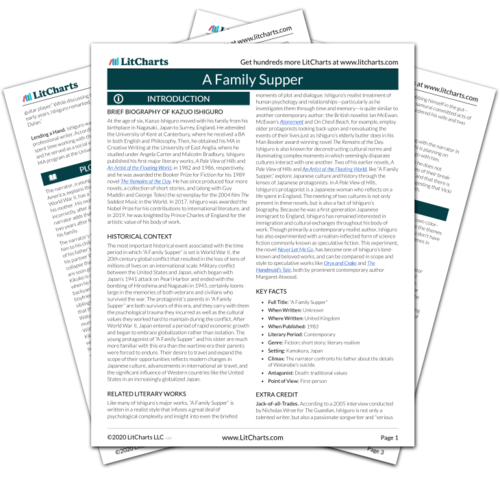 A Family Supper's important quotes, sortable by theme, character, or . Description, analysis, and timelines for A Family Supper's characters. Explanations of A Family Supper's symbols, and tracking of where they appear. An interactive data visualization of A Family Supper's plot and themes. At the age of six, Kazuo Ishiguro moved with his family from his birthplace in Nagasaki, Japan to Surrey, England. He attended the University of Kent at Canterbury, where he received a BA in both English and Philosophy. Then, he obtained his MA in Creative Writing at the University of East Anglia, where he studied under Angela Carter and Malcolm Bradbury. Ishiguro published his first major literary works, A Pale View of Hills and An Artist of the Floating World, in 1982 and 1986, respectively, and he was awarded the Booker Prize for Fiction for his 1989 novel The Remains of the Day. He has since produced four more novels, a collection of short stories, and (along with Guy Maddin and George Toles) the screenplay for the 2004 film The Saddest Music in the World. In 2017, Ishiguro was awarded the Nobel Prize for his contributions to international literature, and in 2019, he was knighted by Prince Charles of England for the artistic value of his body of work. 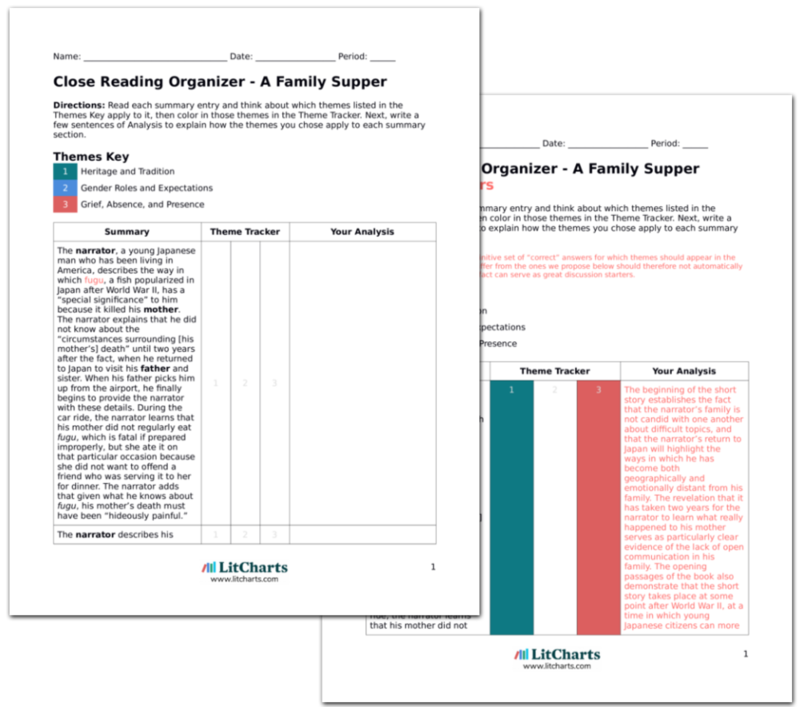 Get the entire A Family Supper LitChart as a printable PDF. The most important historical event associated with the time period in which “A Family Supper” is set is World War II, the 20th century global conflict that resulted in the loss of tens of millions of lives on an international scale. Military conflict between the United States and Japan, which began with Japan’s 1941 attack on Pearl Harbor and ended with the bombing of Hiroshima and Nagasaki in 1945, certainly looms large in the memories of both veterans and civilians who survived the war. The protagonist’s parents in “A Family Supper” are both survivors of this era, and they carry with them the psychological trauma they incurred as well as the cultural values they worked hard to maintain during the conflict. After World War II, Japan entered a period of rapid economic growth and began to embrace globalization rather than isolation. The young protagonist of “A Family Supper” and his sister are much more familiar with this era than the wartime era their parents were forced to endure. Their desire to travel and expand the scope of their opportunities reflects modern changes in Japanese culture, advancements in international air travel, and the significant influence of Western countries like the United States in an increasingly globalized Japan. Like many of Ishiguro’s major works, “A Family Supper” is written in a realist style that infuses a great deal of psychological complexity and insight into even the briefest moments of plot and dialogue. Ishiguro’s realist treatment of human psychology and relationships—particularly as he investigates them through time and memory—is quite similar to another contemporary author: the British novelist Ian McEwan. McEwan’s Atonement and On Chesil Beach, for example, employ older protagonists looking back upon and reevaluating the events of their lives just as Ishiguro’s elderly butler does in his Man Booker award-winning novel The Remains of the Day. Ishiguro is also known for deconstructing cultural norms and illuminating complex moments in which seemingly disparate cultures interact with one another. Two of his earlier novels, A Pale View of Hills and An Artist of the Floating World, like “A Family Supper,” explore Japanese culture and history through the lenses of Japanese protagonists. In A Pale View of Hills, Ishiguro’s protagonist is a Japanese woman who reflects on a life spent in England. The meeting of two cultures is not only present in these novels, but is also a fact of Ishiguro’s biography. Because he was a first-generation Japanese immigrant to England, Ishiguro has remained interested in immigration and cultural exchanges throughout his body of work. Though primarily a contemporary realist author, Ishiguro has also experimented with a realism-inflected form of science fiction commonly known as speculative fiction. This experiment, the novel Never Let Me Go, has become one of Ishiguro’s best-known and beloved works, and can be compared in scope and style to speculative works like Oryx and Crake and The Handmaid’s Tale, both by prominent contemporary author Margaret Atwood. Climax: The narrator confronts his father about the details of Watanabe’s suicide. Lending a Hand. Ishiguro was not always a scholar and professional writer. According the British Council, Ishiguro spent time working with the homeless community in Glasgow, and he served as a social worker in London before entering his MA program at the University of East Anglia. Lathos, Athena. "A Family Supper." LitCharts. LitCharts LLC, 10 Apr 2019. Web. 23 Apr 2019. Lathos, Athena. "A Family Supper." LitCharts LLC, April 10, 2019. Retrieved April 23, 2019. https://www.litcharts.com/lit/a-family-supper.